Looks like ‘Balika Vadhu’ fame actor Sidharth Shukla is determined to stay in news. Sidharth has been released on bail after hitting three cars and ramming in his luxury SUV into a divider last evening in Mumbai. Reportedly, around 6 in the evening Sidharth Shukla was coming from Oshiwara’s Mega Mall’s side when he lost control of his vehicle. Apparently, Sidharth hit a pole and collided with three other cars before ramming into a divider. The actor has escaped the accident with minor injuries. However, according to a police officer in the process one person has been injured. Police arrived on spot few minutes later and arrested the actor. Sidharth was arrested under IPC sections 279 (rash driving), 336 (endangering life or safety of others), 337 (endangering life or personal safety of others) and 427 (mischief causing damageto the amount of Rs 50). Sidharth was only released after paying the penalty of Rs 5000. Upon inspecting the SUV it was noticed that the air bags in the car did not open. Further investigation is ongoing to find out whether Sidharth was under substance influence of any kind at the time of the accident. 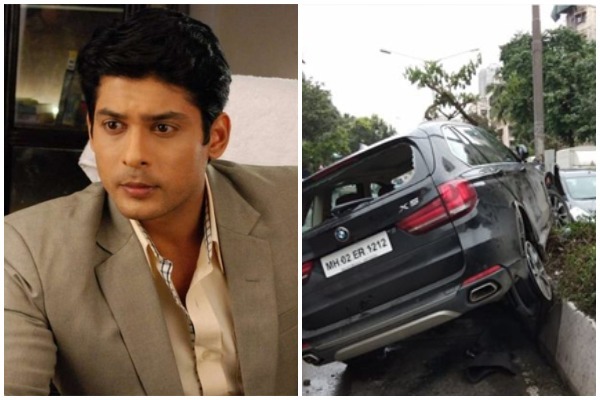 #BalikaVadhu & #DilSeDilTak fame #SidharthShukla has met with an accident today!! This is not the first time that Sidharth has been under the radar for driving skills. During 2014’s New Year’s Eve, the ‘Dil Se Dil Tak’ actor was caught driving under alcoholic influence. Sidharth was booked under ‘drunk and driving’ case and was fined with Rs 2000. Next : Priyanka Chopra, Ekta Kapoor Among Variety’s Top 500 Influential Business Leaders!